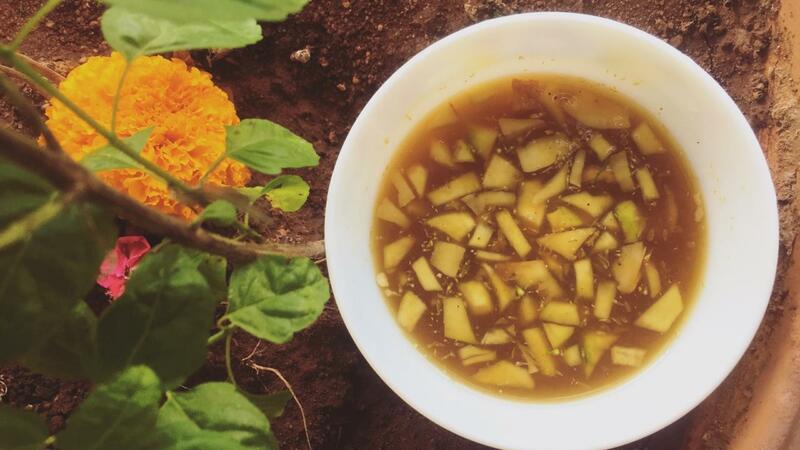 The Ugadi Pachadi is the most important dish of the festival, a preparation signifying “Shadruchulu” or all the six tastes – sweet, sour, salty, bitter, hot as well as tangy. It serves as a reminder to the people that life has all kinds of experiences ranging from sweet to bitter. Some of the ingredients of the pachadi are tamarind, jaggery, margosa (neem) flowers and leaves, chillies, salt and raw mango. In some homes, the preparation is more liquid, while some prepare it like a thicker chutney. The dish also has medicinal values and works as a coolant, and is said to prepare you for the ensuing hot summer in the state. Apart from the pachadi, few other delicacies are also specially made for the festival. Mamidikaya Pulihora or raw mango rice is a seasonal preparation, as green mangos start being available during this time of the year. Many people even follow a custom of not eating mangoes before Ugadi, and thus this is the day when they are tasting mangoes from the new season for the first time. For them, this rice preparation with grated or chopped mangos, chana dal, peanuts and green chillies with a hint of asafoetida is perhaps the first mango preparation to be enjoyed during the season. Other mango preparations such as Mamidikaya Pappu or mango dal are also in demand. Bobbatlu or bakshalu is a sweet which is made during the New Year not just in Telangana, but in neighbouring Maharashtra, Andhra Pradesh, and Karnataka. 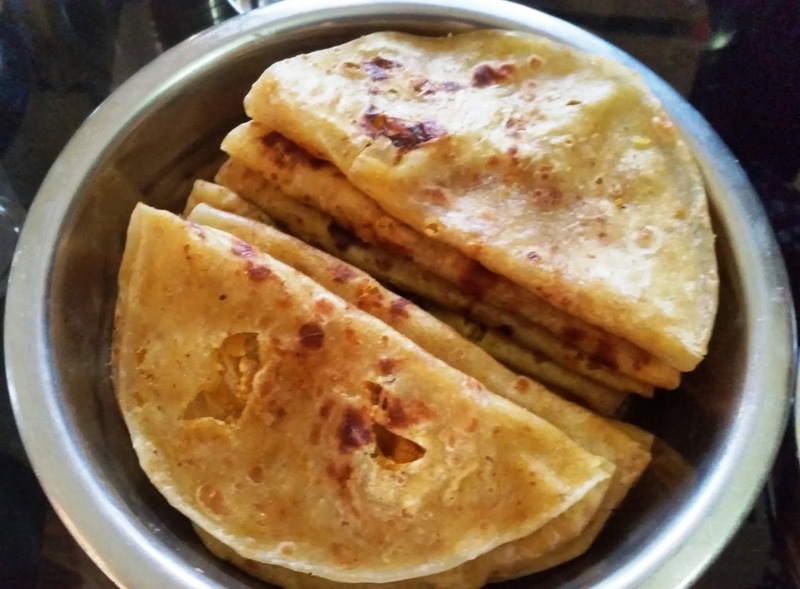 Going by various names such as puran poli, polelu or holige, it essentially a sweet paratha made of flour-based dough and stuffed with a filling of chickpea flour and jaggery, which is prepared in ghee on a tawa. In variations to the recipe, moong dal, khowa or sugar are alternately used. 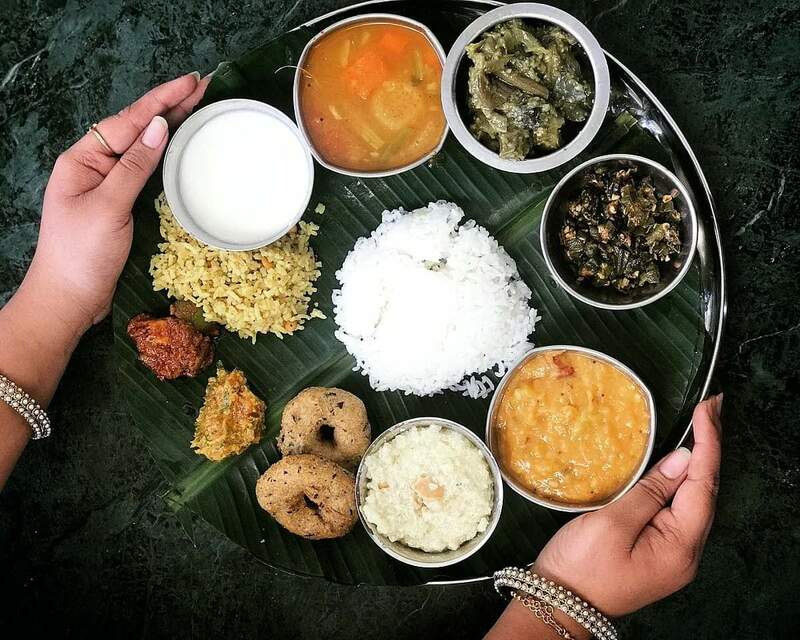 Apart from the three dishes above, families generally get together for a sumptuous meal to celebrate the festive spirit. Desserts like Poornam Boorelu, Kajjikayalu, and Semiya Payasam as well as pachadis of various types are much in demand. 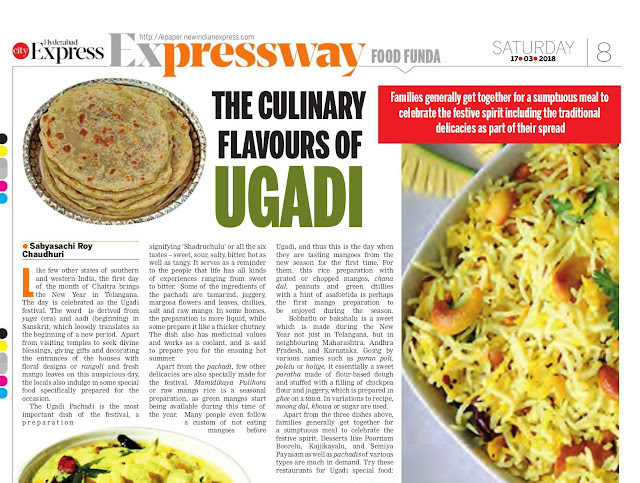 Restaurants in the city also have special Ugadi thalis for this occasion, while sweet shops also offer their best varieties. Note: This is an updated version of the article originally published in New Indian Express Hyderabad on 17th March 2018. Some pics are courtesy Aarti David.